Over the years Orkney Heritage Society has published a number of books, either on its own or in conjunction with other organisations or professional publishers. 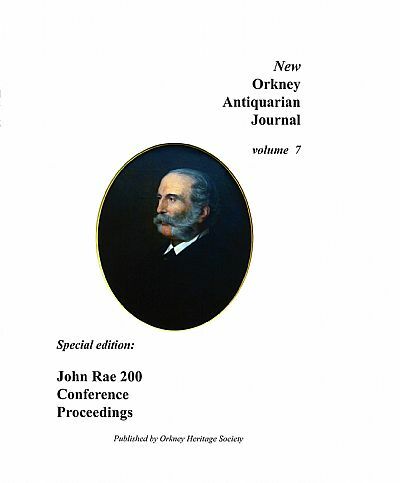 The New Orkney Antiquarian Journal was first published in 1999 as a joint venture with Orkney Archaeological Trust. Limited numbers of volumes 2, 3, 4 and 5 are available (see below). Volume 1 is now sold out. Volume 8 was published in September 2018. It commemorates two significant milestones in the historiography of Orkney: the death of Willie Thomson in 2016 and the 50th Anniversary of the Orkney Heritage Society in 2018. All but one of the authors of the papers were either peers or former pupils of Willie Thomson, or are past or present Chairs of the Society. The exception is Else Mundal, whose contribution makes a trilogy of new perspectives on early 12th century Orkney. More detail here. Now available from our online bookshop. Volume 7 (right) was published in late 2014.
o r by post by downloading an order form here. The Society publishes an Annual Newsletter. This contains news of the Society and short articles of local interest. Copies are sent free to Society members. Information on most previous newsletters is held here.